Its weight strained my arms as I lifted the box off the counter and ripped off the wrapping paper. I knew I was in for an amazing cooking experience when I opened that famous orange box that originated in France. There is sat…in all its purple glory, lovely “creamy-ness” on the inside, gleaming new in its unused stage. My hands fairly itched to apply some heat and see what would happen. hype” if its true?? I had come to the point that I decided to “settle” for an IKEA cast iron dutch oven only because I just could not justify the cost of the glorious Le Creuset….the wondrous pot of magic…the be all and end all of dutch ovens. I was…basically satisfied with my IKEA knockoff it did a good job and stood up to my demanding cooking fairly well. I didn’t like that the interior was not enameled but hey for $50 one can not complain too much. So I have been playing with my Magic Purple Pot for almost a year and I find with each time I pull it out from its place of honor on the Metro Shelves I fall for it all over again. I have decided it is nothing short of magic the way one can put the simplest bits into it, apply some heat, a bit of time and the Magic Purple Pot weaves it spell. I have found myself loving the process of braising, granted it does take a bit of time but it’s not time spent in front of the stove for the whole process its more like 30ish minutes prep to brown off your proteins, give you aromatics and braising liquids a head start then pop it into the oven to allow the magic to work while you do..what ever it is you do, for the next few hours. But enough of this gibber-jabber on to the cooking! 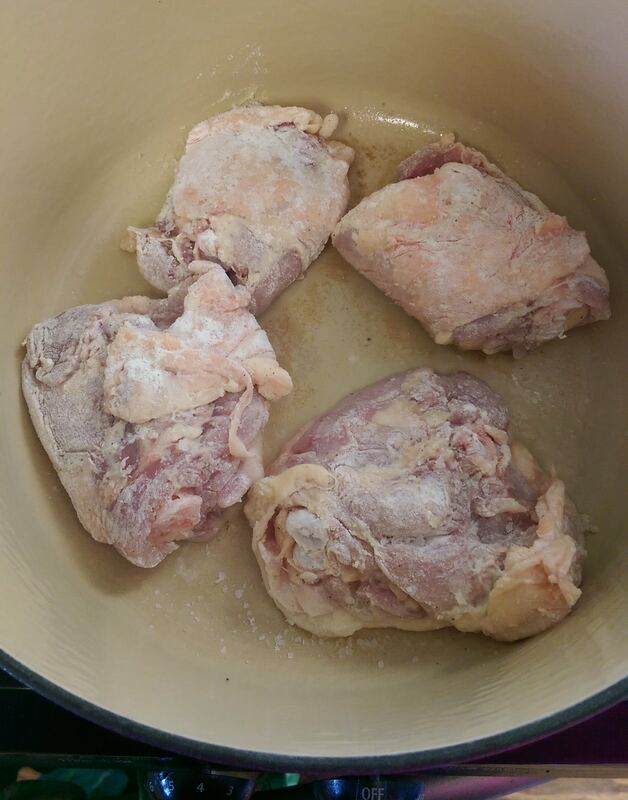 Preheat your dutch oven while it is heating up combine a few pinches of salt and some pepper with the flour, dredge your thighs in the flour and set aside. Add a couple of tablespoons of oil to your dutch oven allowing to heat up, add a few of your thighs to your pot being careful to not overcrowd the bottom of the pot. When putting the pieces in I usually put them in at 12 then 6 followed by 3 and 9 taking about a minute to do so. This allows the metal to heat back up between the addition of each piece. Now once you have them all tucked into your magic pot DO NOT fiddle with them just let them lay in the same position for about 4 minutes then you can take a peek to see if they are nicely browned then you can give them a flip to do the same to the other side. 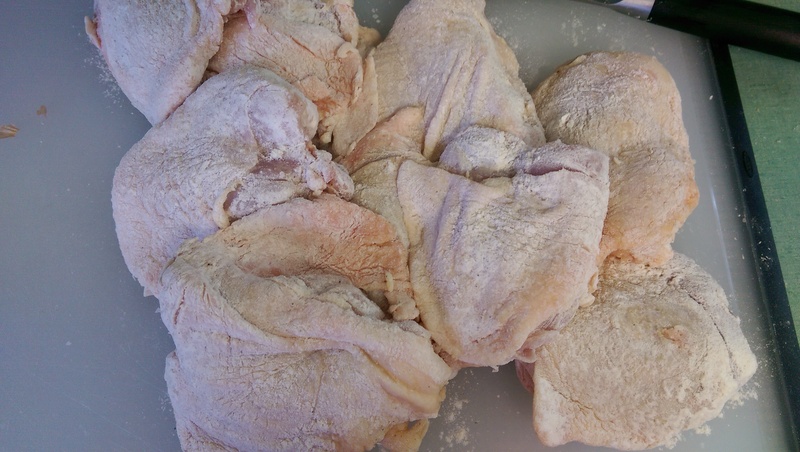 You are just looking to gain some color (and add some flavor) to the skin,not to actually cook the thighs, repeat until all your thighs are browned off, set them aside for now. 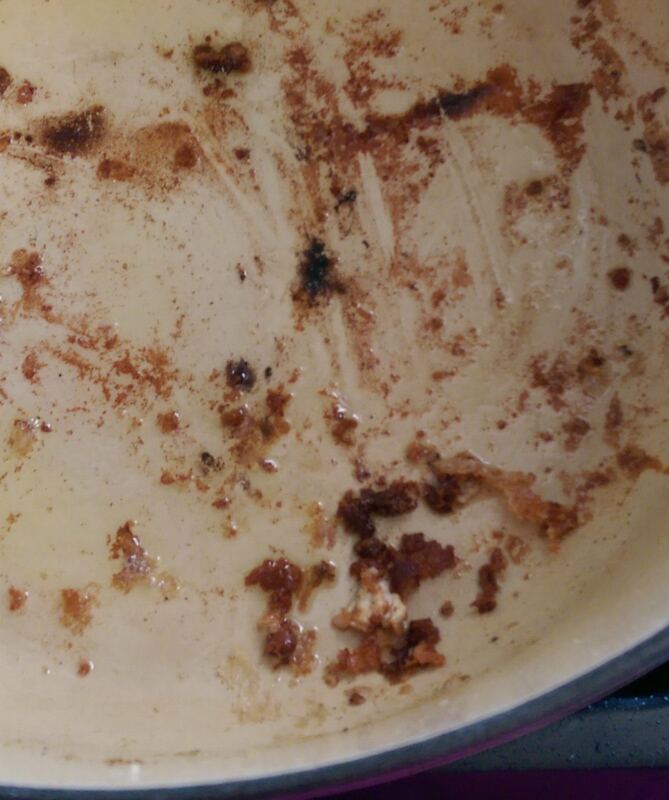 Pour off any excess fat that has cooked out… OK take a look at this photo see all those browned bits? Don’t scrape them out, you want those little flavor bombs in your pot! 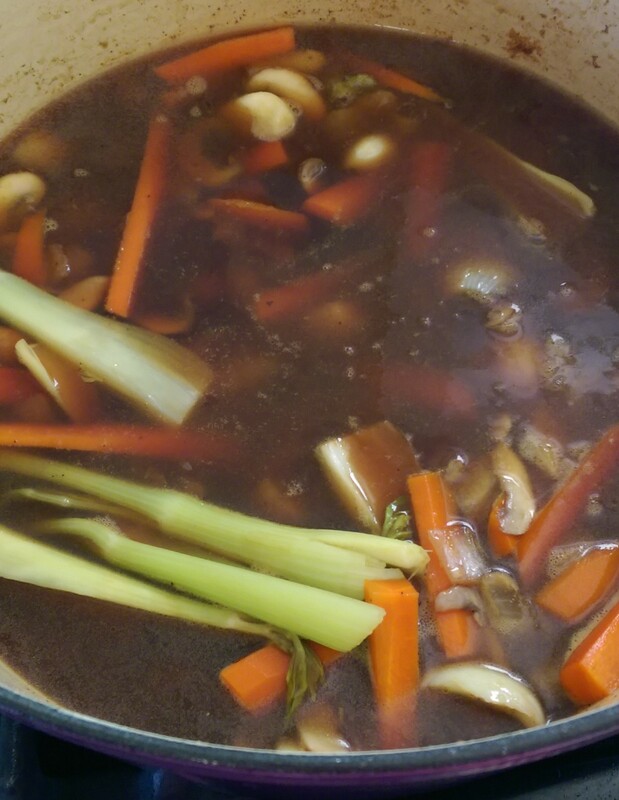 Now its back on the heat, add in your mushrooms, onions, carrots, garlic and celery. Let them sweat down…the moisture from them will loosen the flavor bombs adding to the awesomeness of your braising liquid. 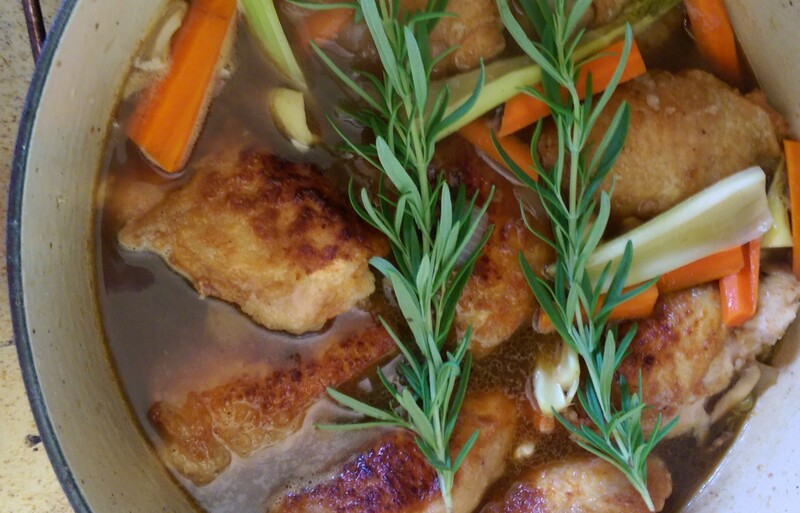 Once the veg has wilted down pour in your bottle of Marsala and allow it co come up to a simmer give it a few minutes to work over the veggies then start tucking in your chicken thighs, nestle them right down in the fluid pushing the veggies aside and on top if need be of the chicken. Again allow it to come up to a simmer then put on the lid and off into the oven for a good 2-3 hours…no you can not take the lid off! Most of the braising liquid cooked out of my Magic Purple Pot by the time I removed mine from the oven (I wanted to used this mushroom sauce) but if you would like to used the braising liquid for your sauce remove the pot from the oven after 2 1/2 hours, set aside the chicken and toss out the veggies, add the cream to the pot and reduce. I served my fall apart tender chicken thighs with mushroom sauce from a previous entry. Well thanks, I appreciate that. Though I will admit that’s the most difficult part of this process for me. The cooking and recipe creation those are like breathing, I don’t have to put a strenuous efforts into that part of the process it usually flows right along. I just got a cast iron pot ( also for cheap) and used it got the first time last night. Oh it is magic indeed! It fills the place with good smells and the eyes that popped when they tasted it and the noses that sniffed when they walked into the room. And it is so easy to use. I agree with you in its magic!